A month ago I posted on this very cool set of four Mattel 1:55 scale diecasts based on characters from the festive Cars inspired book, Mater and the Easter Buggy. If you missed that original full write-up, make sure to check it out HERE! In that post, I gave my overall thoughts on this collection, showed illustrations from the book and included packaged shots of the characters. I had also promised to revisit the post and update it with my additional thoughts and LOOSE pics come Easter. Well, since it's still technically part of Easter today (yup, Easter Monday is a thing—who knew? ), I'm right on target ;) consider this your update! Let's take a closer look now that I finally opened them all up. To start things off, Lightning McQueen (who's look is from a moment in the book when he gets paint dropped all over him), is really quite cute. Though I have plenty of Lightnings in my collection, it's fun to have one more unique [non-film] scene specific variation. Ramone's "Eastery" yellow, orange and pink colors are sweet. You can't have enough paint job variations of Ramone! One like this has definitely never been done before. Interestingly enough, he's barely in the book— seen only from the back (at beginning of the story) and then from a high up/far away perspective at the end. Mater is pretty close to your standard Mater diecast, but this time he sports his book accurate green doors with the multi colored egg shapes painted over them. His classic "A113" license plate remains the same. The Easter Buggy himself is, of course (since it's a brand new character), my favorite of the group. He looks so cute and is very accurate to the book's illustrations of him! There are a few minor differences (mainly in regards to color), but the design itself looks very close. They even got his "Hoplight" tire brand right, which I always thought was a cute little detail. 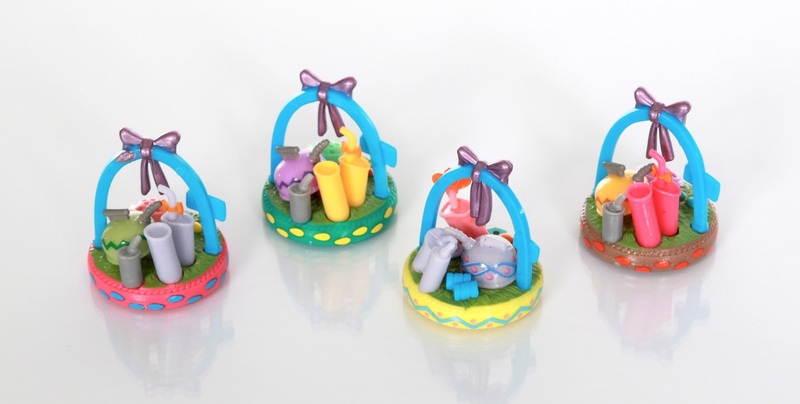 Part of the charm of these diecasts is that each one comes with an "Easter tire basket" accessory (which I love—such a brilliant idea in the book); and surprisingly, each character's tire is uniquely detailed/decorated and accurately matches the book's illustrations! Mattel could have easily done something generic for these, but attention was given to the look of all four. Oddly enough, I have not seen these in stores since I initially found them over two months ago. Despite the fact that these were a retail exclusive at Toys R Us, I feel distribution was still extremely limited. I'm glad I found them when I did! You can still find them on eBay and Amazon, but their prices have really skyrocketed. If you're still looking to add these to your Cars collection, be sure to check current eBay listinings HERE or Amazon using the direct links below. Best of luck on the hunt! As usual, be sure to leave any thoughts or questions in the comments below.